The Riviera 5400 sees the famed Coomera boatbuilder capitalising on its success with the Belize 54, Riviera 52 and 525 for a new design aimed at both local and international markets. After extensive consulting with customers, Riviera have produced another stylish, versatile gem. Australian boatbuilders taking their product into the highly competitive global marketplace face the challenge of meeting expectations in two hemispheres. In essence, they need to be both a global and a local brand at the same time. The immaculate aquamarine hull of Riviera’s new 5400 Sport Yacht we tested would complement any dock from Venice to Sardinia to Fort Lauderdale to Rushcutters Bay, and that’s exactly what this premier boatbuilder intends. A concerted push into global markets requires a superior product with significant points of difference to the competition, and the 5400 easily attains these benchmarks, and adds another layer of innovation and technical integration. Ocean put the 5400 through its paces in far from ideal conditions. A nasty 2.5-metre-plus southeasterly swell slamming into the Gold Coast seaway breakwater proved the boat’s seakeeping qualities. The hull’s fine entry and slightly wide downturned chines kept the sheets of spray to a minimum, while the solid keel ensured reassuring tracking through the bulging grey swell lines. Riviera’s experience with pod drives (more than 500 hulls since 2008) shows. For its size, with its Volvo IPS 950s, the 5400 is deceptively quick. A deadrise of 11.6 degrees kept the bow down onto the plane, and even at 34 knots back in calmer waters, only minimal trim was needed to mitigate a substantial cross wind. 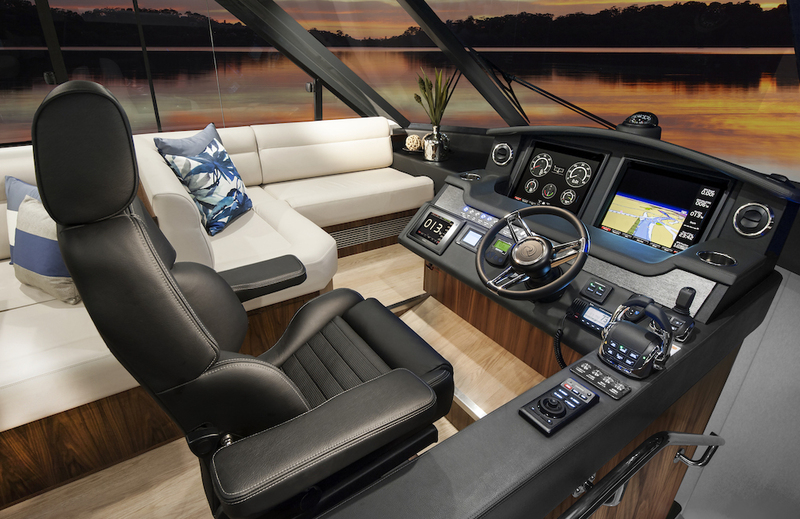 Riviera 5400 Sport Yacht Cockpit. Riviera 5400 Sport Yacht Saloon. Riviera 5400 Sport Yacht Helm. The boat is a completely new design from the keel up, but has evolved from the development and tank testing of the Belize 54, Riviera 52 and 525, where incremental improvements were noted then incorporated. Peering through the curved toughened glass windscreen, the bow appears to slope away, but in the residual chop on the Broadwater the running angle of five degrees felt correct, with the optimum running angle being 3.5 degrees. Part of the reason for the 5400’s agility is a dry weight of just 21,700 kilograms, but Riviera’s reputation for safe and strong passage-making hulls hasn’t been compromised. The boat features hand-laid GRP from the waterline down, reinforced on the bottom of the boat, in the keel and through the chines. Back in May, at the launch of new models, complete with mock-up sections at Riviera’s Coomera factory, CEO Wes Moxey emphasised how the builder was extensively consulting with current and potential owners, about what they all wanted in their boats. In the case of the layout of the 5400, and especially the cockpit/entertaining area, which flows into the saloon, the designers have seamlessly melded the desire for space with luxurious practicality. Just three easy wide steps from the 350-kilogram hydraulic swim platform is the very generous sized teak-laid cockpit. 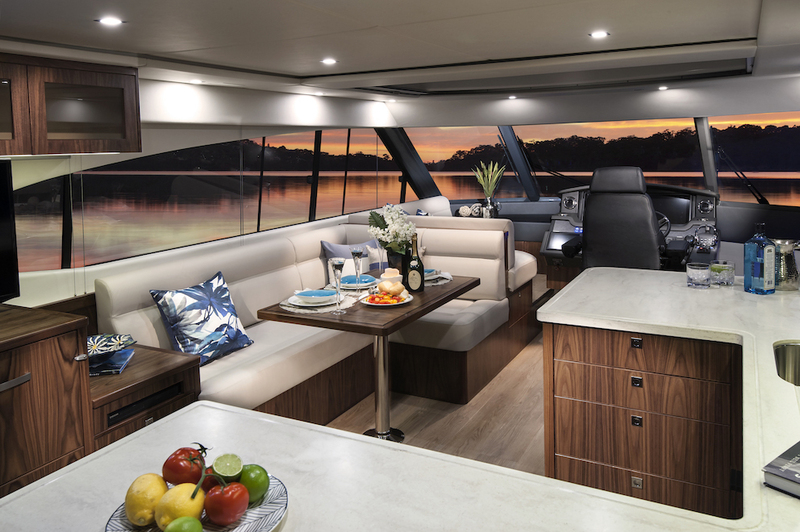 A large forward-facing transom lounge with recessed drink-holders is sheltered from the elements by an extended fibreglass hardtop. The armrests lift up to accommodate a couple of fenders. A retractable sunroof is on hand to suit the conditions, while side clears offer wind protection without detracting from the al fresco amenities. An all-weather galley complete with twin Kenyon electric barbecues, fridge, icemaker, and wet bar is located along the port side of the cockpit. Guests can relax opposite in the L-shaped lounge with teak table, which can convert into a daybed. 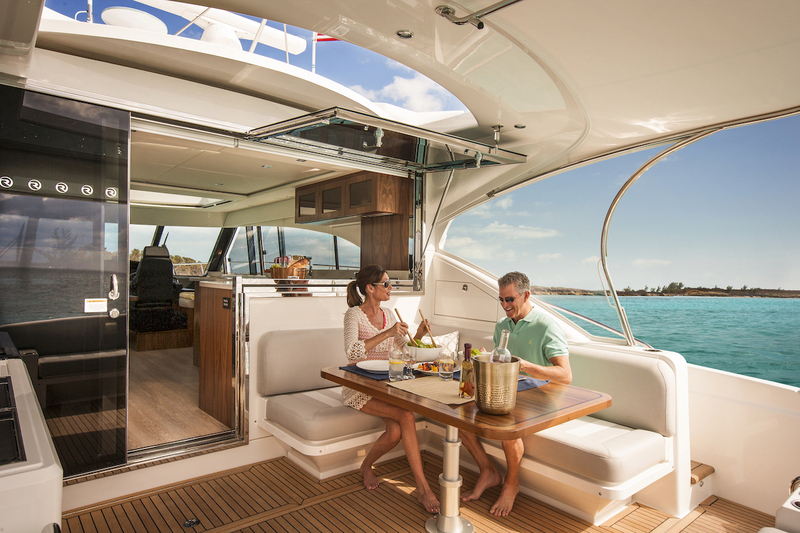 A hinged window with gas strut and safety latch opens up the entire cockpit to the saloon, creating a multi-faceted dining and entertaining zone all laid out on a single level. 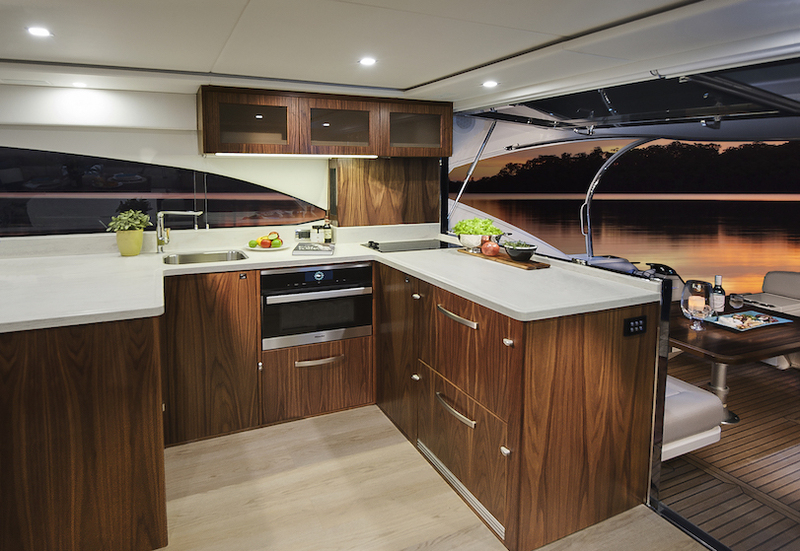 Adjacent to the outside lounge/dining area is the saloon galley, with an Isotherm fridge and freezer, Miele Oven, dual-element cooktop, dishdrawer, and Corian sink cover that doubles as a chopping board. Smartly finished walnut overhead cabinets provide storage. Bar stools forward of the galley space are a desirable option, and were on the test boat. Just inside the three-setting sliding door is a wine cooler and cocktail cabinet with bottle storage, while lockers hold the glasses snug in racks that don’t shift, even in an extremely lumpy seaway. A 40-inch Samsung monitor swings out on an electric arm, which combined with a Blu-ray player and five surround-sound speakers, ensures a comprehensive entertainment package. Of course it can all be accessed via an iPad thanks to the boat’s CZone connectivity and Wi-Fi interface. 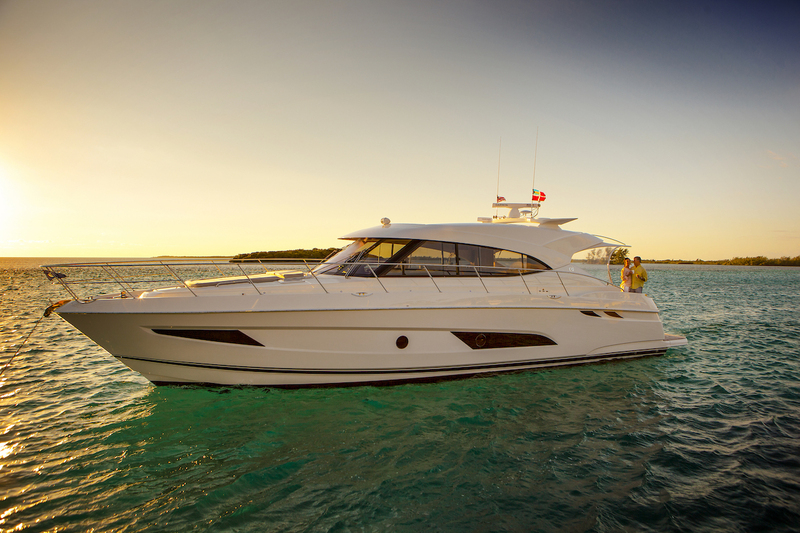 Riviera 5400 Sport Yacht at sunset. Riviera 5400 Sport Yacht Master Stateroom. 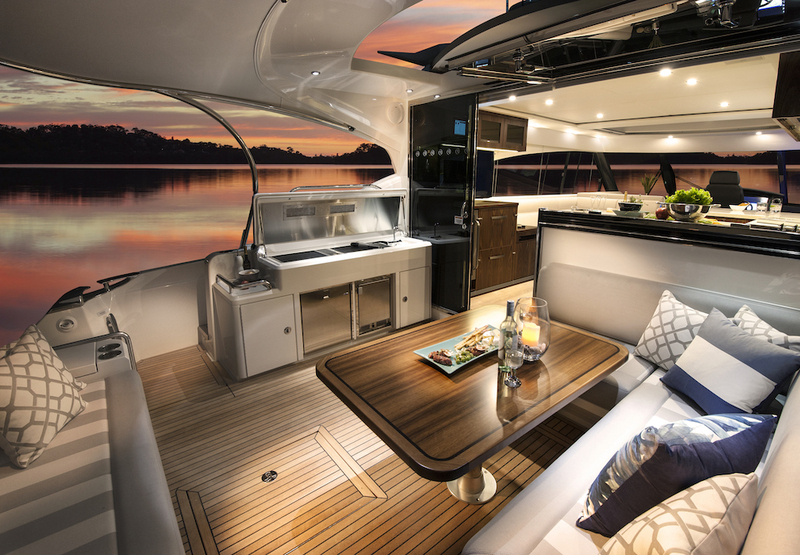 Riviera 5400 Sport Yacht Galley. An L-shaped lounge finished in Wortley Linen leather with cushions and polished dinette table caters for inside dining preferences, but full side windows still allow natural light to flow into the space. The helm station bristles with smart one-touch technology, from the twin 17-inch Garmin screens displaying all engine and navigational data, to cameras trained on the anchor, stern, and engine room. There’s a separate eight-inch MFD just for the engines, along with a touch screen for the CZone digital switching package, which monitors and operates critical onboard systems including batteries, lighting, pumps, entertainment devices and appliances. The beautifully stitched leather Recaro helm seat boasts three settings, and thoughtful details such as the option of angling the seat down a few degrees making it easier to get in and out of. The superior level of fit-out is again evident in the owner’s full-beam stateroom. This sumptuous space is voluminous enough for a walk-around king-size bed with innerspring mattress. Its inviting ambience stems from the combination of earthy, light tones. There is also a deep pile carpet, American walnut finish for the various drawers and lockers, one fixed recessed window and a porthole to allow cooling, sea-tinged ventilation. A Chaise day longue to starboard complements the plush surrounds. Foam-backed headliners in the ceiling mute sound and vibration to minimum levels, while the ensuite has an ample shower, Corian benchtops and a vanity basin. The layout is a popular three-cabin and two-bathroom combination, or an optional two-cabin layout with lower saloon. 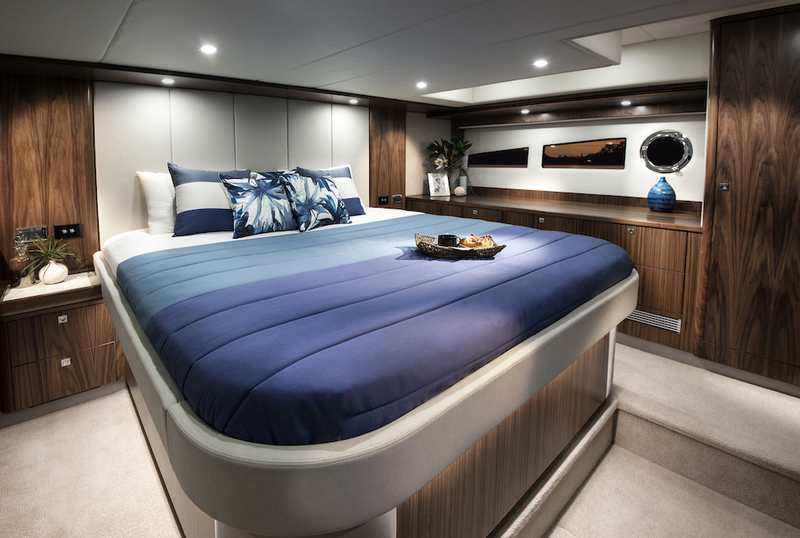 The third cabin to port has bunks and possesses generous floor space thanks to hull flare. The VIP stateroom is forward with an island queen bed and shared bathroom, with quality Hansgrohe fittings and a moulded head panel. Each of the staterooms has its own air-conditioning unit. The 5400 easily sleeps six. But there is an option to create a daybed in the saloon, to cater for extra guests. The focus on keeping the boat’s systems running unobtrusively extends to the extremely well designed engine room with acoustic and thermal insulation. It’s easy to access the big six-cylinder Volvo engines (you can walk right around them), as well as the upgraded twin Racor fuel filters, fresh water manifolds, and Oran generator with a sound shield. Twin bilges fore and aft and a state-of-the art fire suppression system contribute to a comprehensive safety system. The tender garage can house a 3.3-metre RIB, Jet Ski or more conventionally powered watercraft. The RIB or jet ski slides-out easily on struts, the whole operation easily handled by a remote control. If you choose to remain onboard, the wide walk-around decks allow secure movement to the foredeck with its double sunbed and shade in the form of a pop-out bimini. Performance has been a renewed focus since Rodney Longhurst took over Riviera in 2012, and that’s borne out in the 5400. Cruising at 19.1 knots at around 1940rpm fuel consumption came to 174 litres an hour. 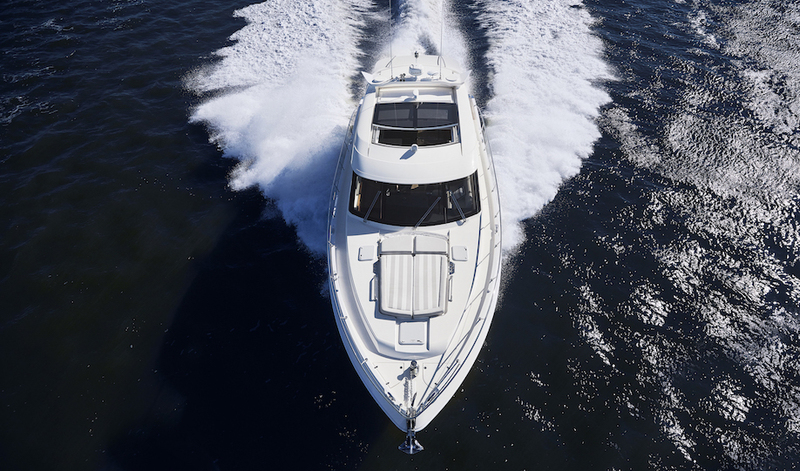 Going by the 3000-litre fuel capacity, a range of 300 nautical miles is quoted. CEO Wes Moxey sees the 5400 as “great value and great quality for the Riviera heritage”. The stylish combination of integrated technology and comfort makes leaving port, passage making and relaxing at the destination highly appealing, while also offering owners the opportunity to maximise their recreational options in compressed time frames. It’s a winning combination, but will it be enough to propel the Coomera boatbuilder to the vanguard of global boating brands?